The sophistication of structural analysis has evolved side-by-side with computing and graphics technology. Structural engineers have at their fingertips very powerful software analysis tools that assist them in evaluating very large and complex structures for stability, suitability, and code adequacy. The tools themselves vary in complexity in proportion with the engineering analysis required of them – the most complex and unique engineering problems requiring the most advanced analysis tools. Structural Integrity is a leader in advanced structural analysis (ASA), utilizing state-of-the-art software and material science expertise to solve an array of structural and mechanical problems. Structural analysis, in its most basic definition, is the prediction of the structural performance of a given structure, system, or component to prescribed loads, displacements, and changes in temperature. Common performance characteristics include material stresses, strains, forces, moments, displacements and support reactions. The results from a structural analysis are typically compared to acceptable values found in design codes. Meeting the design code acceptance criteria ensures a design that protects the public’s health, safety, and welfare. ASA extends this basic definition of structural analysis to one-of-a-kind problems where the acceptance criteria may not be well defined. 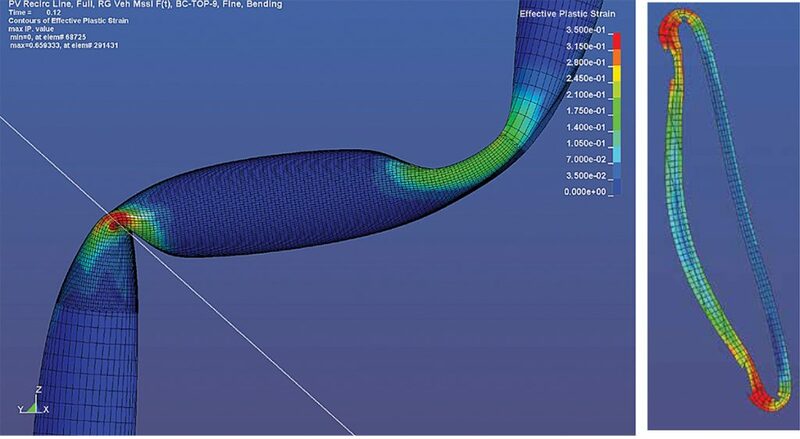 Since loads, material behavior, or the structure itself can go beyond the scope of basic design codes, ASA requires an in-depth understanding of modeling techniques, software limitations, and non-linear material behavior. In ASA, sophisticated finite element analysis solvers are utilized to gain a detailed understanding of a system’s non-linear mechanical behavior, providing a full three-dimensional view of the critical stresses and strains in a loaded system. Finite element modeling starts with the development of a finite element mesh to represent the structure under consideration. Boundary conditions, material properties, mechanical and thermal loads are then assigned to the model. The finite element solver then uses either an implicit or explicit method to determine the structure’s response to the model definitions. Implicit methods solve a finite element model by inverting the model’s stiffness matrix. The time it takes to perform an implicit analysis is partly dependent on the size of the stiffness matrix and how many matrix inversions are required. Setting up the difference between implicit and explicit FEA program solvers and implicit solvers are impractical for non-linear problems. For each time step, a linear analysis requires one matrix inversion while a non-linear analysis will require several matrix inversions to converge to a result. Implicit analysis can be used to analyze static loads or low frequency dynamic loading such as earthquakes. Implicit solvers are found in most structural analysis software including RISA, SAP2000, Abaqus, and ANSYS. Implicit methods become problematic for highly non-linear problems. For those types of problems an explicit solver, which solves for nodal accelerations directly, is typically used. This allows a solution to be reached without the formation and inversion of a model’s stiffness matrix (a computational savings), but the methodology itself requires significantly smaller (and hence more) time steps to reach a solution (a computational expense). Explicit solvers can be found in specialized structural analysis software including Abaqus Explicit and LS-DYNA. Structural engineers require extensive training to properly perform ASA and understand modeling, software, and solver limitations. Successful ASA of a concrete structure requires an advanced material model that captures the highly non-linear behavior of concrete and can converge to a solution involving severe material damage. Concrete material models that fail to capture degradation, account for triaxial stress states, load-rate effects, or time dependent material behavior can lead to erroneous results. Structural Integrity’s success in ASA of concrete structures stems from ANACAP, our proprietary concrete constitutive model. ANACAP has been shown to accurately represent concrete behavior in systems subjected to static, impact, and seismic loads and has been utilized in commercial, bridge, hydro, and nuclear power plant projects. The material model can account for cyclic degradation, multi-axial cracking, load-rate effects, aging, creep, shrinkage, compressive crushing, confinement, concrete-reinforcement interaction, and high-temperature softening. ANACAP can be utilized in all standard finite element shell or solid element formulations. Figure 1 shows the extent of cracking in a reinforced concrete dam at the end of a non-linear seismic time history analysis utilizing the ANACAP concrete model. Within the ANACAP model, concrete cracks never heal once formed. This results in localized load redistribution, a better representation of the dynamic behavior of the model, and more accurate results when compared to “built-in” concrete constitutive models found in standard finite element libraries. ASA of steel components typically includes coupled nonlinear thermal-mechanical analysis to assess the structural performance of new designs, as-built vulnerabilities, efficacy of retrofit modifications, or to perform root cause failure analysis. Structural Integrity commonly performs analyses to evaluate fatigue and fracture risks in steel structures where finite element modeling is often employed. When a system is comprised of several non-monolithic components, additional constraints are included in the finite element model to accurately represent the contact and interaction that might occur between the components during the analysis sequence. Figure 2 shows localized stress results from a non-linear analysis of a steel condenser support bracket. The model was used to determine the original design’s cause of failure and to develop a retrofit strategy. The model accounted for high operating temperatures that have a non-linear impact to the mechanical properties of the steel components. 3D brick finite elements were used in a fine mesh to model the configuration of the welds and to simulate the structural load paths accurately. Output from this analysis was utilized in fracture mechanics calculations to predict the service life of the bracket when subject to low frequency cyclic loading. Explicit finite element solvers are typically required to evaluate shock, blast, and impact problems when traditional calculation methods lead to unrealistic or overly conservative results. The ASA of complex loading scenarios such as tornado missile impact, aircraft impact, load drop, or bomb blasts is a specialty of Structural Integrity, especially when applied to critical infrastructure (e.g., nuclear facilities and other safety-related structures). Figure 3 depicts plastic strain contours from a tornado missile impact analysis of a safety-related ventilation duct. Since the duct is required to remain functional after impact, an accurate estimate of the duct’s post-impact deformation was needed. The restricted cross section of the plastically deformed model was measured and used to determine if the duct’s ability to function remained above a minimum acceptable threshold. Large critical structures, facilities, and equipment that are exposed to earthquake excitation often require ASA to account for the interaction between the structure itself and the underlying soil. Improved structural response estimates are obtained when this soil-structure coupling is accounted for. Soil-structure interaction (SSI) problems have been historically solved with SHAKE/SASSI, spectral analysis software, although programs such as LS-DYNA are now offering similar analysis capabilities. Expertise in soil mechanics and foundation engineering is a prerequisite for proper SSI analysis. Seismic analysis, with or without SSI, is performed to determine a structure’s response to ground motions. Different seismic analyses have different degrees of complexity and might include equivalent force analysis, response spectra analysis, non-linear pushover analysis, or non-linear time history analysis. The structure’s response to a seismic event is used to ensure sufficient structural capacity and may also be used as input in fragility analyses of housed systems. Facilities often house critical equipment that needs to be operational following a seismic event. The criteria to determine the equipment’s functionality might be stress- or strain-based for mechanical components, but is often acceleration based, especially for electrical components.Fragility analysis compares the local accelerations, imposed by a seismically loaded structure on the housed equipment, to the acceleration limits that the equipment can withstand and still function (as substantiated by testing or analysis). These analyses are often performed for nuclear facilities where both the structure and internal equipment need to remain functional following a seismic event. 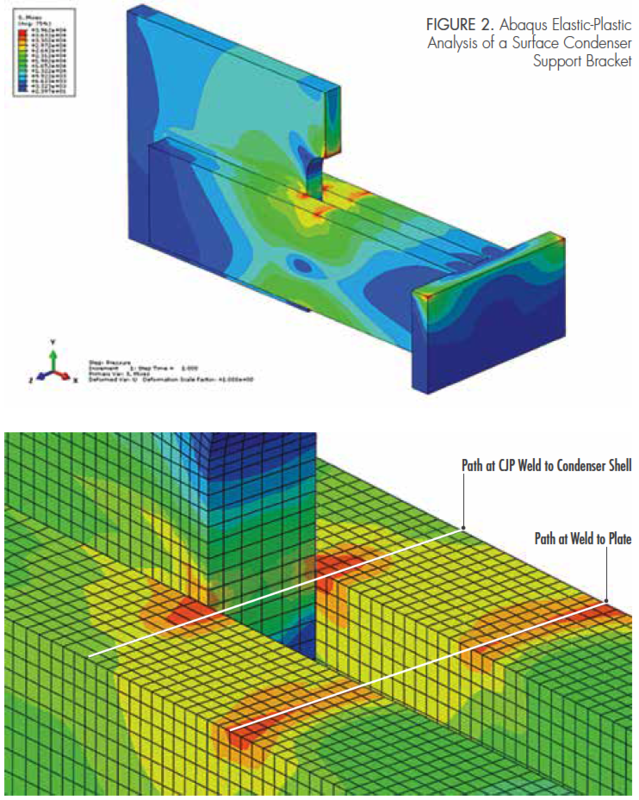 Figure 4 shows an ANSYS model and a modal response of an emergency cooling tower subject to a beyond design basis seismic event (BDSE), which was used in a fragility evaluation. The finite element analysis and subsequent calculations served to demonstrate the cooling tower’s resilience and ability to remain functional after BDSE. There are many other examples of ASA that cannot be adequately covered in this brief. Some of these include fluid-structure-interaction problems, or the evaluation of reciprocating equipment or pressure vessels. The necessity of ASA is dictated by the nature of the loading, the complexity of the problem, and the importance of the analyzed component. The proper execution of an ASA requires trained experts who often utilize sophisticated software tools to facilitate the analysis. Structural Integrity specializes in ASA and has significant depth in technical resources, making it a leader in ASA.